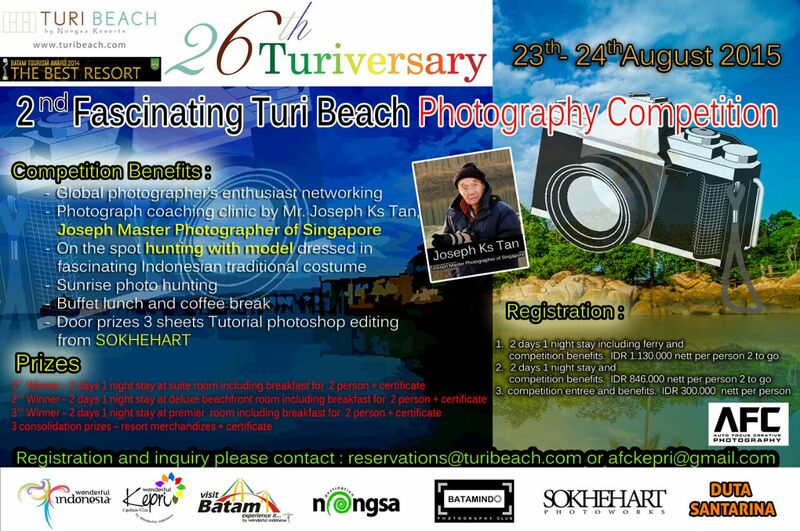 Nongsa, Batam Island, 5 June 2015 – In conjunction with Turi Beach Resort’s 26th Anniversary, Turi Beach Resort proudly presents the “2nd Fascinating Turi Beach Photography Competition 2015”. Following the success of the first fascinating photography competition which was held last year, this year, Turi Beach Resort is going to hold a more elevated competition for its participants. The event will be conducted on 23rd to 24th of August 2015 at Turi Beach Resort. Working together with Auto Focus Creative Photography, a Batam based photographer community, this competition will be more exciting with whole lots of new benefits such as global photographer’s enthusiast networking, photograph coaching clinic by Mr. Joseph Ks Tan from Joseph Master Photographer of Singapore, on the spot hunting with model dressed in fascinating Indonesian traditional costume, sunrise photo hunting, buffet lunch, coffee break and door prizes. The prizes for this competition are varied and all attractive. For the 1st winner of this competition, he / she will get 2 days 1 night stay at suite room including breakfast for 2 person & certificate. For the 2nd winner, he / she will get 2 days 1 night stay at deluxe beachfront room including breakfast for 2 person & certificate, the 3rd winner will get 2 days 1 night stay at premier room including breakfast for 2 person & certificate, and the 3 consolidation prizes will be given resort merchandizes & certificate. Turi Beach Resort nestled in Nongsa Resorts, at the northeast part of Batam Island, and 35 minutes away from Singapore by ferry and 15 minutes from Hang Nadim Airport. The resort which receiving The Best Resort Award by Batam Tourism Office in 2014 offering beautiful green landscaping in a tranquil tropical village featuring Modern-Minimalist accommodation in Tirta and Riani Wing. All 140 deluxe rooms and suites are facing the sea, being well spread over the beach front and the hillside. For more information about Turi Beach Resort, please visit www.turibeach.com or call (+62)778-761-080 and find the updated news about the resort by like the Facebook page at www.facebook.com/turibeach and follow the Twitter & Instagram page at @turibeach. Give It a Reel to Your Fisherman’s Luck to Join 2nd Turi Fish-tival 2016!